From 1940 until 1952, Ray Ellefeson had a remarkable twelve -year, seventeen-team basketball odyssey. In the early 1940’s, Ellefeson played college basketball at Augustana, West Texas State and Colorado. In the mid-1940’s, he played AAU basketball for the Denver Ambrose Jellymakers and the San Francisco Dardis . In the fall of 1946, he signed with the St.Louis Bombers. a member of the newly formed Basketball Association of America. 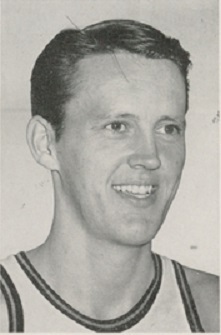 Ellefeson left the team prior to the regular season, announcing that he would enter DePaul University in the fall of 1947. Instead he entered Oklahoma A&M College, at the time one of the top college basketball programs in the country. Ellefeson did turn pro in the fall of 1948 and saw brief action with the powerful Minneapolis Lakers and later the Waterloo Hawks of the National Basketball League before finishing the season touring with the independent Cedar Rapids Raiders. Ellefeson had another brief shot at the NBA in 1n 1950 and played three games with the New York Knicks before spending the rest of the season in the minors with Scranton and Wilkes-Barre in the American Basketball League. Eugene Ray Ellefson Born: Nov 18, 1922 Died: Oct 7, 1994 Hometown: Hopkins, Mn.